Nissan Motor Co. showed off the first electric vehicle under its China-only Venucia brand at the Guangzhou auto show Friday. Dongfeng Nissan Passenger Vehicle Co., a Chinese joint venture of the Japanese automaker, plans to start mass production of the e30 electric car by 2015. 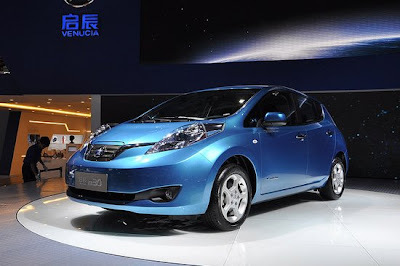 Nissan is currently conducting a feasibility study on electric vehicles in Wuhan, Hubei Province, using its Leaf. It plans to expand the study to include 15 other Chinese cities next year, including Guangzhou, Guangdong Province, and Dalian, Liaoning Province. The Venucia is targeted at first-time car owners in small regional cities. Two models--the D50 compact sedan and the R50 sports hatchback--are already available under the brand.